THE LAND LOSS OF LOUISIANA'S COASTAL REGIONS IS OFTEN DESCRIBED USING AN UNWIELDY UNIT OF MEASURE: the football field. While its an easy frame of reference, it creates the visual image of an area of marshland being submerged one hundred-yard rectangle at a time. Of course, land loss--like football--is a game of inches. Michael Pasquier, the co-producer of the documentary Water Like Stone, told me that the change is imperceptible while it happens. Salt water intrudes across an area that’s almost impossible to comprehend, and Pasquier and director Zack Godshall thought that perhaps the best people to aid in the outside world’s comprehension in real terms are the residents of small coastal communities who see it each and every day. So they headed to Leeville, a tiny village community whose main street, Old US 1, dead ends into a lakefront dirt path called Goat Isle Avenue. The town in Lafourche Parish was founded by Cajuns moving northward after abandoning the site of a previous fishing village called Cheniere Caminada after it was destroyed by a hurricane in 1893. Zack Godshall grew up in Lafayette, and as a child traveled on fishing trips all over southern Louisiana, including Leeville. He recalls the waters as “bountiful” and “beautiful.” It’s those same waters that, through no fault of their own, will sooner rather than later cause Leeville to be abandoned. Godshall always had it in the back of his mind to make a film about Louisiana’s wetlands. He and Pasquier met and collaborated when they were attending LSU almost fifteen years ago. After going to film school at UCLA and working on other documentary projects, he returned and became part of the LSU’s faculty. Pasquier is a professor there as well, working in religious studies. Together they decided to take the project on in earnest, but they knew the kind of film they wanted to make would be different from a typical story about environmental and cultural changes in the wetlands. Pasquier had built a lot of relationships in the area during some of his own scholarly work. He handled a lot of the groundwork and early research for the film, and conducted the interviews with residents. Godshall filmed and edited the movie. Together they’ve focused on avoiding a traditional narrative format or a confrontational examination of cause and effect. This isn’t simply a history of the town either, even though it has a diverse and interesting past, both distant and recent. 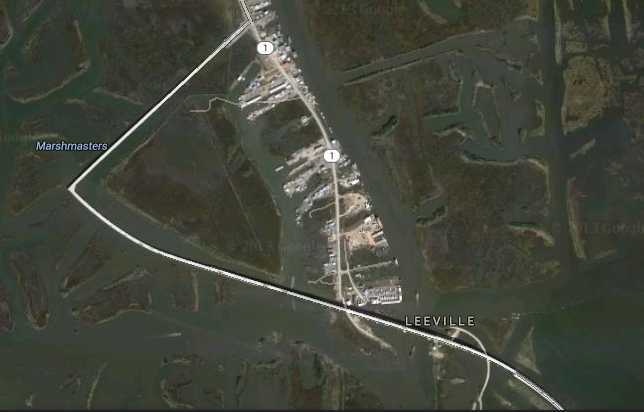 In 2008, Leeville came under threat after fishing waters were closed after the Deepwater Horizon oil spill. This was the injury after the insult of not being included inside any federal or state levee system post-Katrina and the rerouting of Highway 1 away from the town when it was rebuilt as an elevated toll road leading to nearby Grand Isle. The vulnerability of these people, both physically and emotionally, moved both men during the filming of the movie. They may live in a situation that is unimaginable to many, even those just on the other side of Interstate 10, but they as much as anyone from an unrecognized community are eager for their story to be told and told accurately. Water Like Stone plays at the Contemporary Arts Center on Friday, October 11th at 7:45 PM and at the Prytania Theater on Monday, October 14th at noon. Ryan Sparks is the editor of Southern Glossary. Follow him on twitter.